Thanks to all my friends who filled out this year’s survey regarding what you’d like to see on the blog and YouTube! I’ll still be referencing your responses for another week or so, so if you still want to let your opinion be heard, you can fill it out here. Some of your answers really surprised me! Like how many of you want to keep hearing faith-filled or inspiring posts, how many of you don’t care for live videos on Facebook or Instagram and how you’d love to learn about the logistics of running our big household. So thanks again for your input and I hope to keep giving you stuff you want to see! Today I’m sharing how we do mealtime at our house. 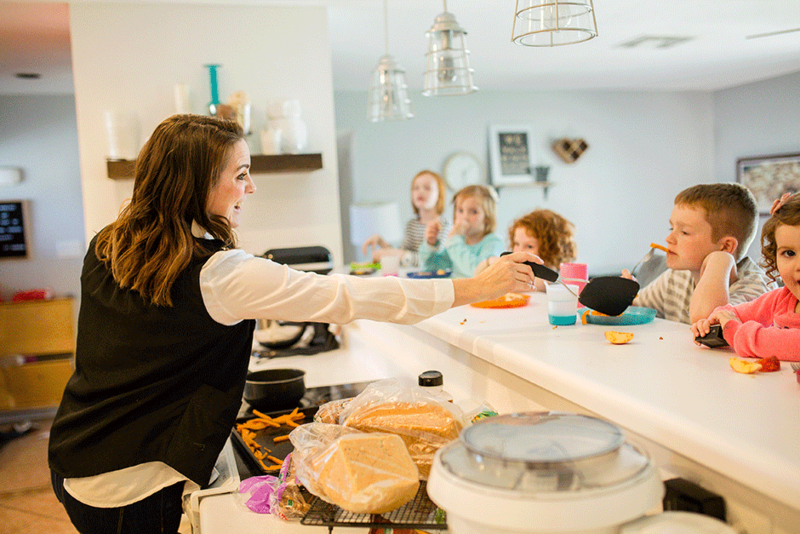 It’s probably the messiest and least glamorous part about having a large family (um, ok, there’s basically nothing glamorous about 8 kids – ha!) but meals are a necessary evil that happen 3 (and often many more) times a day. Sometimes we succeed and everyone gets fed something nutritious and delicious and they stay satisfied for 3 hours until the next meal. Sometimes…not so much. But maybe some of our hacks will also help you feed your little animals as smoothly as possible! The BIGGEST thing that has streamlined meal time at our house is this long bar counter! You can read all about our kitchen remodel here (the before picture is just frightening – you’ve been warned!) but I knew that once that wall came halfway down and we added the eat-in portion of our kitchen, things would get so much easier, and they did! It was so essential for me to be able to see all my kids eating, especially the babies, while I was still warming and serving food in the kitchen. Our kitchen table is around the corner so having the kitchen totally blocked off made it nearly impossible to prevent food fights, messes and other calamities unless I was sitting down with them the entire meal (and you mamas know we all basically eat standing up). We still have dinner at the table all together, but for breakfast, lunch and snacks, this is the place. Also, it really opened up our whole main floor so it’s now much more fun to have company over! Second, we store all the kids cups, plates and bowls in that bottom drawer of the island. As you can see in the above real-life picture (well, ok – in real life I’m usually wearing my pajamas through lunch but you get the idea) someone pulled the drawer front off and baby Alice is always pulling junk out onto the floor but having the kids be able to get their own plates and stuff is life changing! We also have a chore wheel for dish/meal jobs that we rotate every Monday. It’s just a couple of paper plates stacked on top of each other with kids’ names and jobs written on it. Each big kid is assigned one of 4 jobs that needs to be done for each meal (the twins share a job). The chores are dishwasher loading, unloading, clearing/wiping the table/bar and sweeping the floor. It’s made for a much easier dinner prep and clean up and everyone is accountable for a specific task! Third, I stick with familiar foods and try to sneak in veggies and fruits where I can. Guys, I’ve experimented with so many diets and tricks to try to get my kids to eat healthier without wasting food and it is HARD! So if you’re even trying to feed your kids something other than Doritos and Ramen noodles, then I applaud you; it’s not an easy job! We like to make things like enchiladas and lasagna but maybe sub veggies for the meat. Or I’ll make them breakfast for dinner and add a green smoothie to the eggs and toast. I also make lots of big salads full of things they love like bacon or taco meat and lots of ranch dressing! Everyone is required to at least taste an unfamiliar food, although we don’t force anyone to finish anything. If a kid absolutely hates the meal and are still hungry, they can have an apple or piece of bread (no toast or jam or anything fancy, just plain bread). The trick trying to make sure they have a full belly, but without rewarding them for not eating dinner! So far I’m pretty happy with the system. One other thing I wanted to share is my new method for choosing lunches. We get so sick of sandwiches around here that I’ve been desperate to find anything else they’ll eat and be happy with! So our latest favorite lunch menu is just a glorified snack smorgasbord. The day these pics were taken, the kids ate rotisserie chicken, sweet potato fries and some apple slices with peanut butter. The kids think it’s great to change things up a bit and I get out of my sandwich/burrito rut. That’s about it! Let me know if you have any more questions or if there are other aspects of dinner/meal time you’d love to see. And I’d love to hear everyone’s tried and true tricks for getting kids to eat! My kids pediatrician told them they have to do polite bites. So if they don’t like a food, they have to take one bite before they can politely say no thank you. And we do something similar to they if they won’t eat dinner, they don’t get good food. We usually tell them a piece of bread a glass of milk. We do let them put a smear of peanut butter on so they stay full until breakfast. What makes me laugh is how often they will say I don’t like what you are making for dinner, and then when they try it they end up liking it! I love it Kristie! It’s really so true – they surprise themselves sometimes, huh?? Great tips except I don’t think you should get over burritos. ? Our bedtime snack options are a cheese stick or yogurt tube- fast, some protein, and no crumbs so they can brush their teeth right away. Hahaha- you know I’d eat burritos every day! Those darn kids get picky though. So high maintenance! Try cutting fruit and veg and have them eat it with a toothpick. Stabbing food can be fun and satisfying. BTW love your kitchen. Love this idea Shari! And thank you – I kinda love it too!